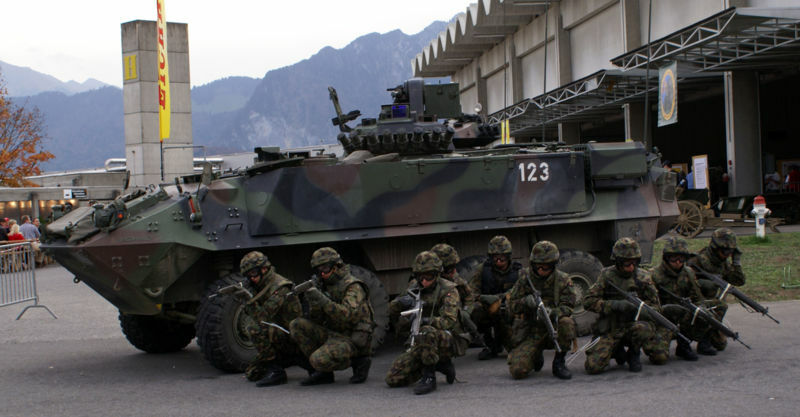 The Mowag family of the armoured vehicle since 1972 is an outstanding export success, reminiscent of the past Swiss pikemen mercenary companies that roamed the battlefields of Europe in the Renaissance wars. This extremely versatile and modular vehicle was produced since 1972 in four derivatives, 4×4, 6×6, 8×8 and even 10×10, all with the same hull, and featured allowing extensive tailorization for any customer, from the engine to the main armament, as well as inexpensive maintenance and reconversions. It has been indeed converted to an air defense vehicle, ambulance, anti-tank vehicle, APC, cargo transport, command & control vehicle, or for electronic warfare, fire support, internal security, mortar carrier, recovery and reconnaissance among other things. It was not uncommon for a customer to purchase the vehicle in a single configuration, then order kits for conversions, and gradually convert obsolescent vehicles for other duties at low cost. The Mowag Piranha (From the famous Amazon river Characidae) was exported to 21 countries and also largely built under license as nowadays it is estimated that more than 10,000 Piranha-based vehicles are in service worldwide. The most famous of them all, the 8×8 is by far the best known and most common. 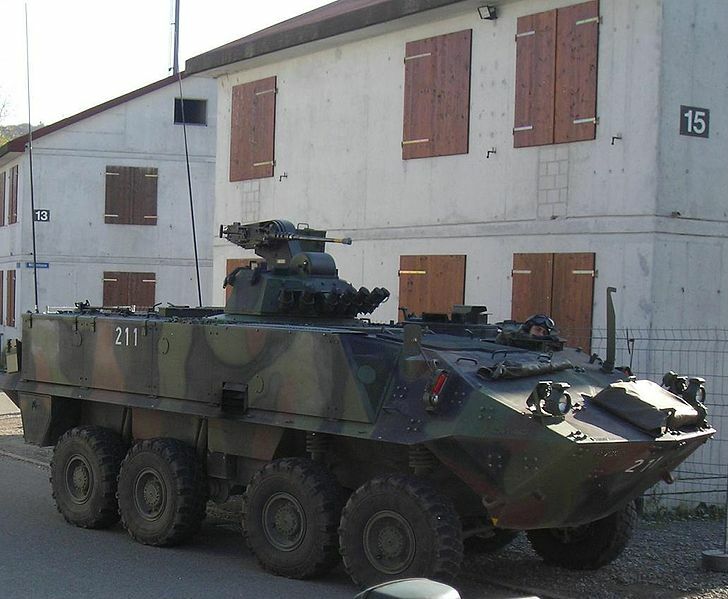 It is also perhaps the most produced 8×8 APC in the Western world, with more than 6,500 vehicles for this version alone. It was by any standards an influential model that spawned dozens of licensed versions, also inspiring a whole genre over five continents. This includes the concept of wheeled IFVs and destroyers that are popular today in many armies, as they can replace costly MBTs in low-intensity conflicts and asymmetric warfare. MOWAG Motorwagenfabrik AG was founded in 1950 in Kreuzlingen as a car company, privately owned by engineer Walter Ruf. It was soon known for its specialized 4×4 trucks, and already earned a contract for the Swiss and German Army with the Mowag T1 4×4 in 1953. But the range rapidly expanded over time, the company producing also ambulances, fire trucks, dummy tanks, electric vehicles, scooters, and tracked tanks. 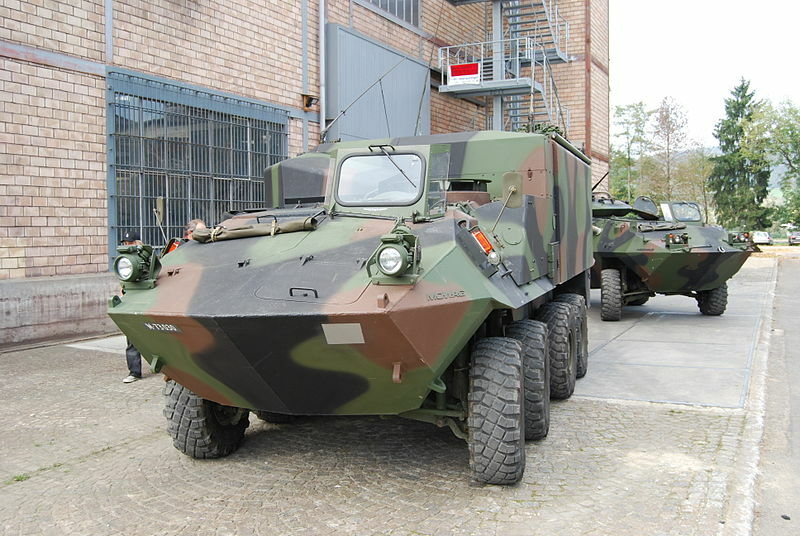 It became rapidly the main supplier of armored vehicles for the Swiss Army and hit its mark in 1972 when revealing the Piranha, which became an instant export success. 2000+ derivatives are now licensed or license-derived versions like the Canadian Coyote and American Stryker. Mowag anticipated Swiss army and international market needs for a modular wheeled vehicle that emphasized low life cycle costs, high reliability, and high availability as a private venture and built, tested the Piranha 6×6 in 1972, historically the first of the family. The name was probably inspired by the characteristically edgy, stealthy-like hull’s shape which became the trademark of this model compared for example to the Soviet BTR-60/70 which had a broken front glacis to allow the driving compartment to have proper windows. The sloped armor shape of the vehicle was not something new, however. Some strong analogies could be found with the American CGC M706 and Russian BTRs for the lozenge-shaped section hull. The hull was entirely made of welded RHA, with an NBC lining (from 1980 on), and made amphibious, with propellers. The nose design was characteristically multi-faceted, with a central spine, and lateral polygons joining the nose to the equally highly sloped sides. The rear was slightly sloped downwards, due to the presence of the main access doors. To avoid being torn in collisions or present a deadly threat to foot soldiers, the edgy beak was softened on the Piranha III. The base armor only protected against small weapons fire and artillery shell splinters and was presumably of 6 to 8 mm, while the slopes made it artificially thicker. It was reinforced on later version, especially on the front glacis against heavy machine gun rounds. Modular amour packages and add-on armor plates (bolted) were also frequently seen with the Piranha III. The driver and commander were seated on the left-hand side, one behind the other after the nose section, each with their own hatch dotted with three periscopes covering the frontal arc. The engine compartment was located on the right-hand side, with exhaust grilles and cooling fans above, the transmission and gearbox were housed in the nose. The troop compartment was located behind, with the main weapon system housing in between, operated by one of the crew members. Cargo capacity was about 3 tons, and there was a carrying capacity of 5-6 fully equipped infantrymen up to 15-16 on the Piranha 8×8. The initial engine was a Mowag diesel 6-cyl. water cooled 275hp (202 kW) coupled with a sturdy Allison MT-653 Automatic 6-speed planetary gearbox transmission. For better motricity distribution was over the height roadwheels, which had tires 13.00 × 20, with a run-flat insert. Depending on the version, the steering was applied to one axle (generally the front one) or two (generally the 1st and last axle). On the III suspensions are active (hydropneumatic). Top speed on flat was as required 100 kph (62 mph) with a swimming speed of 10 kph (69 mph), and 300 liters of diesel which gave about 750-800 km of average operational range. According to the customer’s needs, some vehicles received other engines and transmissions, usually of American origin. Armament differs considerably from one model to another according to the missions. As the main armament, a 12.7 mm HMG turret is found, or a cradle-type Browning 8 mm M1919A4 mount, or the Mowag apex remote-controlled mount present in most APCs. This relatively light weapon station can be swapped for a 20 mm rapid-fire autocannon with AP capabilities, or with bigger calibers for SPAAG variants. With the arrival of ATGMs, some vehicles act as tank-hunters, receiving a fixed TOW ATGM, or a TOW/Mephisto turret. Grenade launchers are also found on most vehicles. This class counted a 4×4, 6×6 and 8×8. The 4×4 (1974) was a gasoline engine prototype equipped with a remote-control or standard cradle/turret for a 12.7 mm weapons station. It was designed for recce primarily but also police duties. The driver was given a folding armored Plexiglas window. There were two roof access/exit doors (no NBC), two side vision blocks and pistol ports. It was demonstrated to Chile but apparently only saw service with Liberia according to one source. 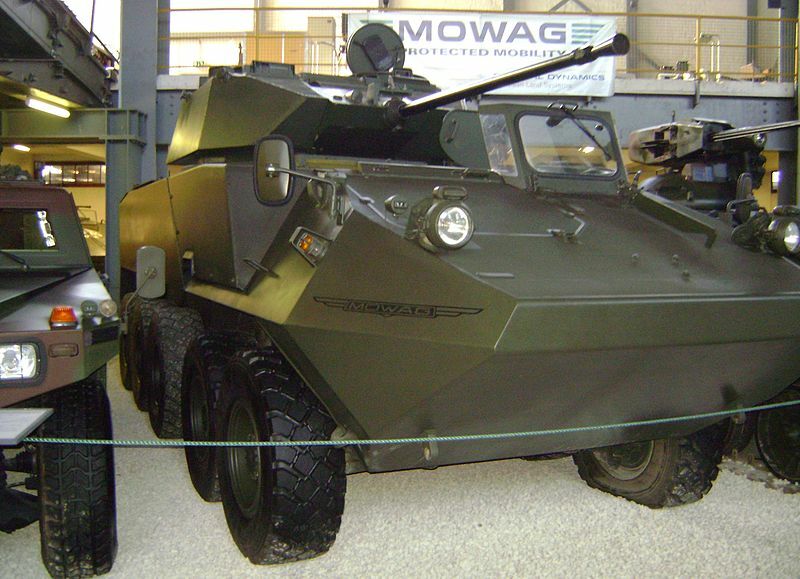 It served also to develop the MOWAG Grenadier and Mowag Spy sub-versions. The 6×6 (1972) presented itself as a lengthened version with two axles at the rear and innovations at the time like a modern drive with independent suspensions, compact front power unit and two orientable propellers for water propulsion. The standard armament (Canada) was a Vickers 76 mm turret also found on the Alvis light tanks family. It was also derived as the AVGP Cougar, Grizzly & Husky. 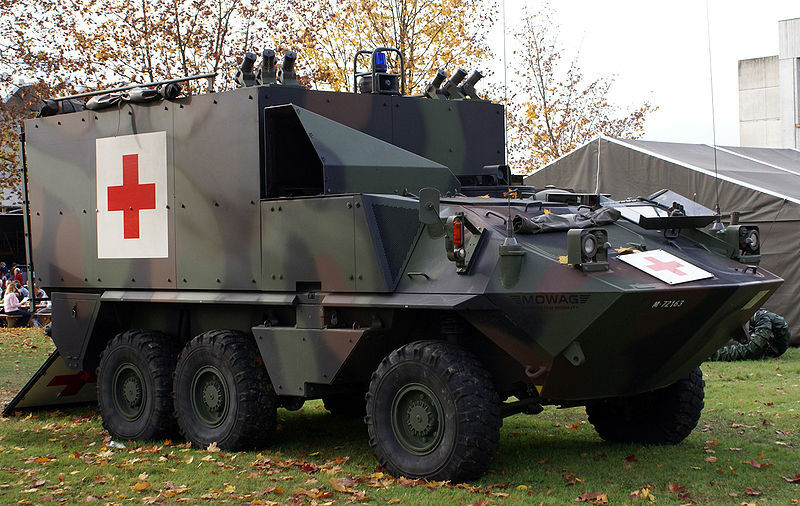 Chile and Switzerland (BGM-71 TOW-armed Panzerjager 90, Converted later to Ambulances and C3 mobile command posts) are customers, with possible re-sells to Ghana & Nigeria. The 8×8 used the very same hull but with an extra axle in the center. The standard engine for the three was a 6-cylinder diesel of 275 hp. Additional specs for the Piranha I 8×8 are: dims. 6,3 x 2,5 x 1,9 m, 12,500 kgs, 3,000 kgs payload. It was given as a standard the same 12.7 mm weapon station. The 8×8 was the most successful of the family, for Australia that developed the Early ASLAV 25 from it, Chile, and USA (First LAV). 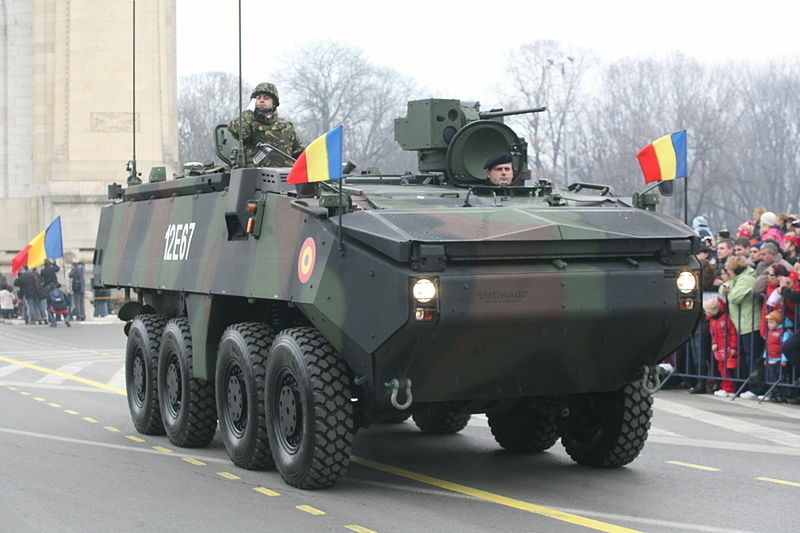 Due to the success of the 8×8 the company decided to focus on this version and improve it in many ways: Lengthened hull (stretched by an additional 290 mm for more internal space) with an upgraded armor, a more modular engine compartment, revised transmission, stronger and larger tires and better braking system. Side extensions gave more internal space, additional pistol ports and protection. 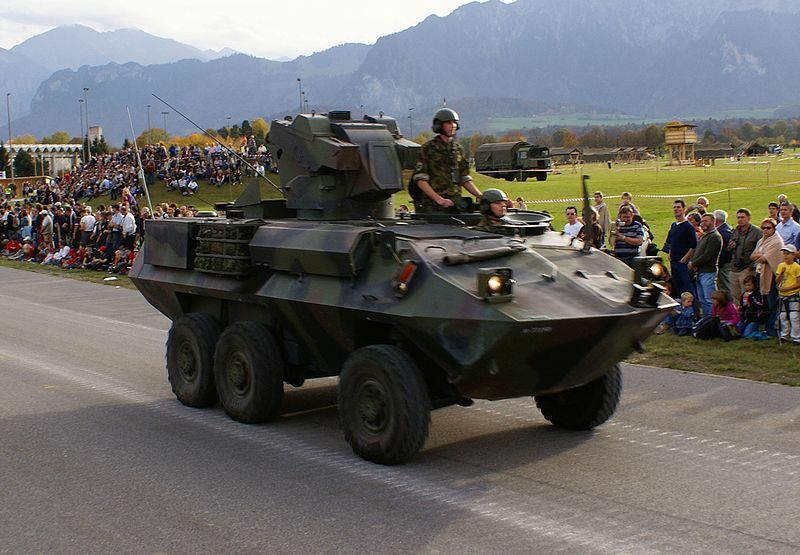 A 4×4 version was developed for the Swiss Army as the Mowag Spy (experimental recon vehicle of 1981), and the 6×6 and 10×10 were only kept as demonstrators. 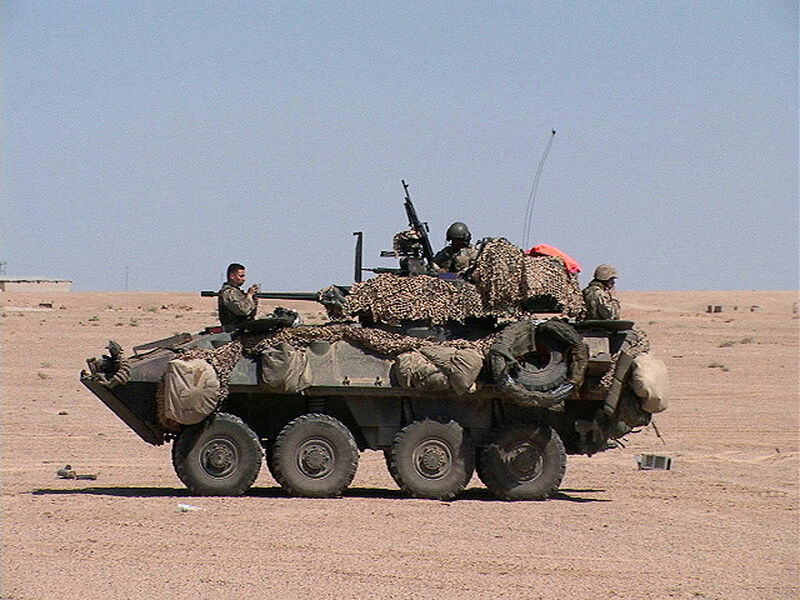 Operators were Australia (ASLAV 25), Canada (Bison APC & Coyote Reco), Oman, Qatar, Saudi Arabia, Sweden (tested one vehicle), USA (Base for the USMC LAV25A2) and the Swiss army that used the APC93. This vehicle came with a large variety of armaments, from the usual 12.7 mm MG turret and 76.2 mm remote-controlled stations to a 20/25/30 mm autocannon turret, or even a 90 mm gun (see later) and an 81 mm mortar. Optional equipment included a full collective NBC lining, air conditioning, and night vision devices. 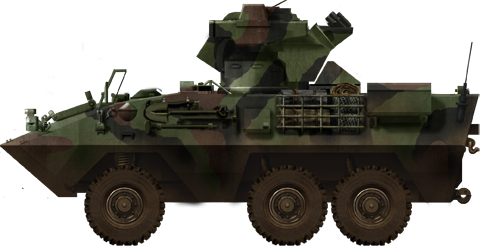 The Giat Industries TS 90 Weapons Station developed for the Mowag revealed at Eurosatory 1986, comprised a 90 mm medium-velocity main gun capable of firing APFSDS-T, HEAT-T, HE, smoke and canister rounds with a total of 43 including 18 ready in the turret. It was coupled with a coaxial 7.62 mm. Specs are: 6,98 m x 2,63 x 1,83 m for 14 tons. For mobility, it could be fitted either with a Detroit Diesel 6V-53T Silver (275 hp), 6V-53TA Silver (350 hp) or Cummins 6 CTA 8.3 (300 hp) powerpack. There is also an automatic fire detector/extinguisher system. Suspensions comprised independent coil springs on the two directional front axles and shock absorbers for the two rear ones. The best known of the serie was also the most exported/license-built of the family. 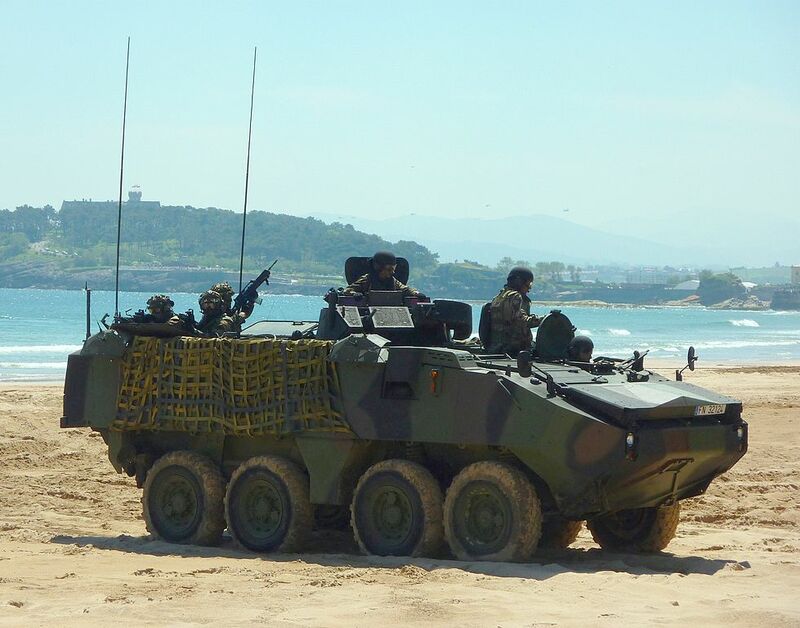 It is produced nowadays by GENERAL DYNAMICS – European Land Systems that acquired Mowag Motorwagenfabriken in January 2004, as a part then as GM Defense (London, Canada), and the fourth European company to join the consortium, now based in Spain. This time, the 4 x 4 configuration was dropped but the 6 x 6 was maintained and the 10 x 10 was further developed. Gets three rear axles and two front steering axles. The three rear ones are fitted with shock absorbers, and coil absorbers for the front ones. Derived from the Mowag Shark it was an attempt to extend the payload by a further extension of the hull. Conceived as a heavy weapons carrier it was only procured to Sweden, which used as a LIRKA command tank and Kapris radar carrier. The regular version (18 tons, 7.45 x 2.66 x 1.98 m) was armed with an Oerlikon GDD BOE/35 mm autocannon KDE coupled with a 7.62 mm FN MAG and 2×3 Nebelwurfbecher 76 mm smoke mortars. The powerpack is a Detroit Diesel V6, V6 53TA 350 hp coupled with an Allison transmission. As the flagship of the company, this APC was entirely overhauled, with the emphasis put on a composite construction, lighter and more compact hull yet better protected for enhanced mobility. The internal volume and payload are also largely optimized comparatively to the hull (11.8 m3), and modularity was pushed further. The III is air transportable, by a standard turboprop C130 Hercules which gave it a large array of strategic deployment possibilities. It is fully amphibious, had two propellers, a trim vane and 10 kph speed when swimming. It is fully tested for all climate conditions, including Arctic, and is fitted with an air-conditioning equipment and heater kit for below 40° temperatures. The vehicle still has the NBC in option (with slight overpressure) but also replaceable by quick-mount add-on armor packages and mine-protection kit that provided protection both against 14.5 mm rounds and an 8 kg TNT blast. Fire extinguishers are also present. 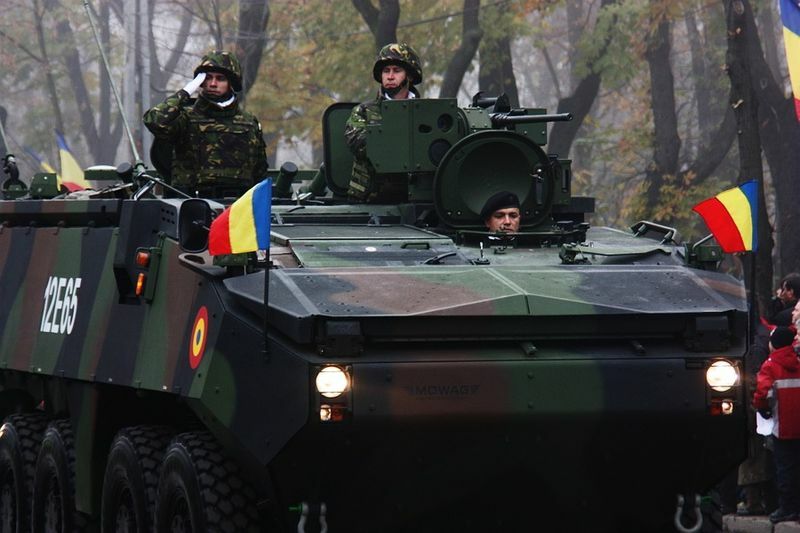 The vehicles came with an ever greater range of weaponry, culminating with a remotely-operated 105 mm turret which provides a clear tank hunter capability and access to the whole range of compatible NATO ammunition. 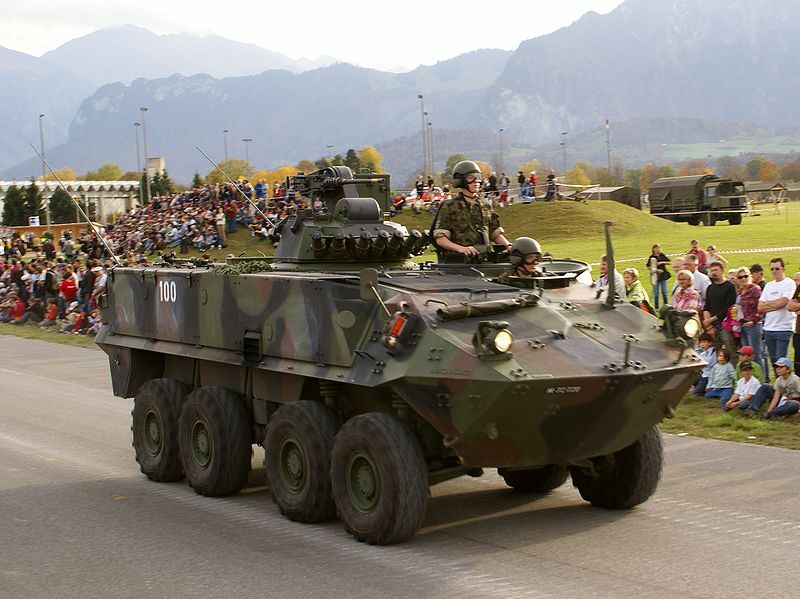 Mowag Piranha III of the Swiss ArmyThis vehicle is also license-built by General Dynamics Land Systems – Canada (LAV-III) and in UK by BAE Systems Land Systems. The Piranha IIIC is now the flagship of Mowag, and features a new level of protection in option with the Saab Avitronics LEDS which comprises a sensor system and dispenser (countermeasures) effective against IEDs and RPGs. The modular engine bay could receive either a German MTU 6V183TE22 (400hp), Swedish Scania DSJ9-48A (400hp), US Caterpillar 3126 (350hp), British Cummins 6CTAA8.3-T350 (350hp) or US Detroit Diesel 6V53TA (350hp). There is an hydropneumatic system with electronically auto-adaptative adjustments, centralized tire inflation system (CTIS), and anti-locking brake system (ABS). Developed from its predecessor as a private venture, the IV put the emphasis on better protection. It is heavier at 25 tons combat loaded and armed normally with a 30 mm chain gun and 7.62 mm LMG. The hull has high-hardness RHA characteristics and there are level B modular packages in addition which provides an all-around protection against 14.5 mm HGMs AP rounds, against 30 mm rounds on the frontal arc, and features hull floors protected against land mines (8 kgs TNT equiv.). It is fitted with NBC in standard and had an external coating paint to reduce its thermal signature. Depending on the payload it can carry from 6 to 10 fully equipped infantrymen. It is propelled by an MTU turbocharged diesel developing 544 hp coupled with a ZF-7 transmission, for a top speed of 100 kph and 750 km range. No order follows bu a production license was acquired by Komatsu of Japan and BAE Systems. 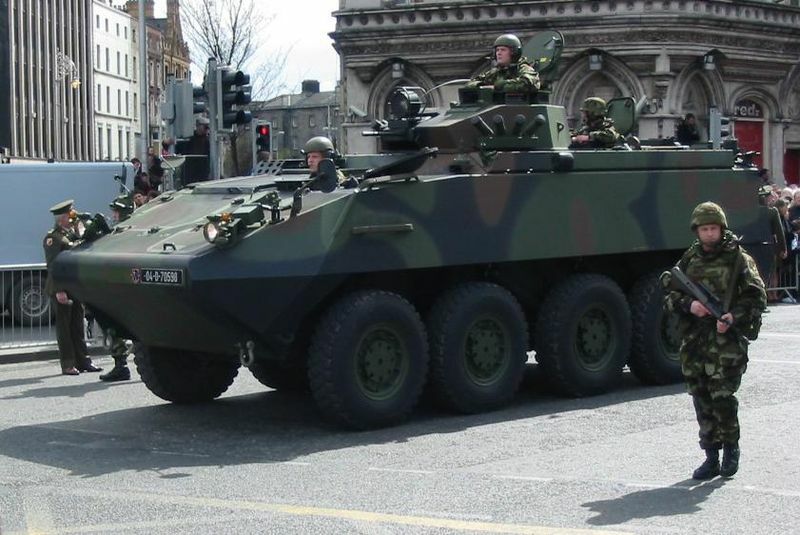 It is largely seen as a transitional model towards the Piranha V.
This new version weighing in between 25 to 30 tons was officially launched at EUROSATORY 2010 on 15 June, and was reported earlier to participate in the British Army FRES program and had undergone the “Trials of Truth” which were held in 2007 at the MoD’s armored trials and development unit at Bovington. On 8 May 2008, however, the bidder status was withdrawn, as no agreement on commercial conditions could be found. If budget constraints are lifted the UK could renew its interest in the vehicle but the FRES program (five families of medium-weight vehicles in 16 variants) was announced in 2012 “dead in the water”. The model 5 was tailored to meet the program’s requirements and is an even more compact 8×8. Steering is distributed on all axles but the third at the rear. Internal storage is allegedly greater and there is a brand new open electronic architecture. There is also a central tire inflation system with 30 seconds automatic controls intervals. At 28 ton it is air transportable by an A400M. Many new protection features are provided following the experience in Iraq and Afghanistan like integrated mine-protected seats and shaped hull plates. There is an overall protection against RPGs, 30 mm guns on the frontal arc, and 14.5mm AP rounds all around. There is, in addition, a hard-kill defensive aids suite and protection against IEDs. It is propelled by an MTU 6V199 TE20 550 hp diesel. The 8×8 has been largely at the cornerstone of the sales, mostly in Europe, but also the middle east (EAU, Qatar, Oman), Africa (Ghana, Liberia, Botswana), Pacific (Australia, New Zealand) and noteworthy the Americas: USA, Canada, Chile and Brazil. 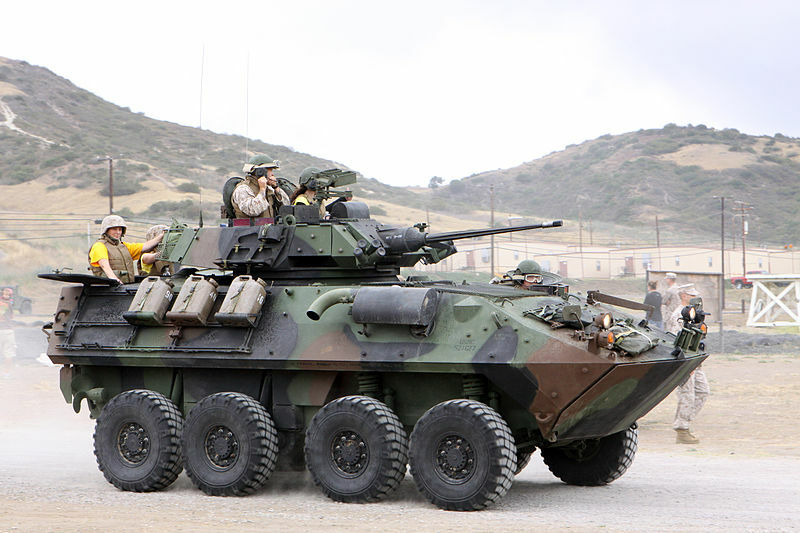 Of course, Australia, Canada, and USA with the LAV and Stryker could hardly be considered properly as “exports” since they are built locally on proper specifications, but the base design and many patents associated with the design are sourced in Switzerland’s Mowag company. The same could be said for the Japanese Type 96 built by Komatsu. The Piranha inspired the Italian Freccia/Centauro and The German-Dutch Boxer. It was also accessible to many manufacturers with less high-intensity technological know-how than those required for a scratch-built 3rd gen. MBTs, spawning similar vehicles: Malaysia with the DEF-Tech AV8, the Turkish Otokar Arma and FNSS Pars, Austrian Pandur, Serbian Lazar, Finnish Patria Pasi, Polish KTO Rosomak, or Saudi Arabian Al Fahd. Monaco: 2 (V) for the Carabiniers Monégasques (guards). 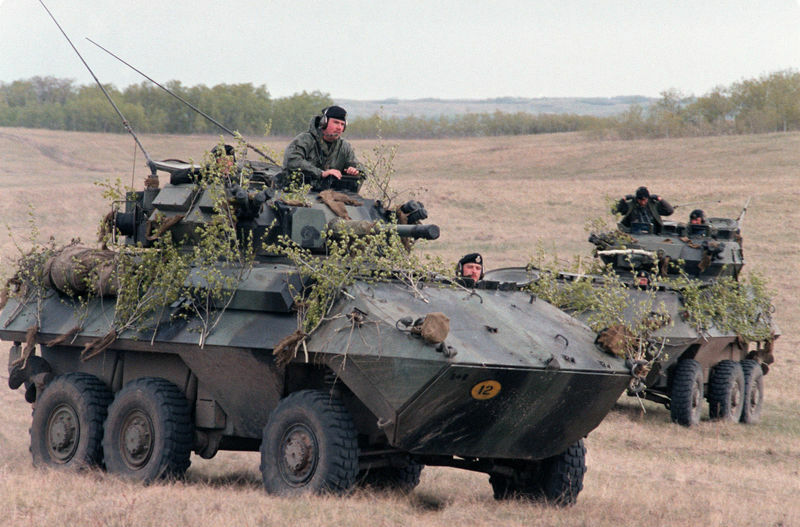 General Dynamics Land Systems – Canada conceived the LAV III 8×8 now in service with Canada (650 ordered) and New Zealand (105 delivered in 2003-2004). These are based on a license from Mowag in 1995. This platform was intended to replace both the Grizzly and M113 APC. The first deployment came with UN operations in Eritrea in early 2001. In 2011 and upgrade contract was passed for 550 LAV III vehicles and 66 more in 2012 which are intended to extend their operational life until 2035. 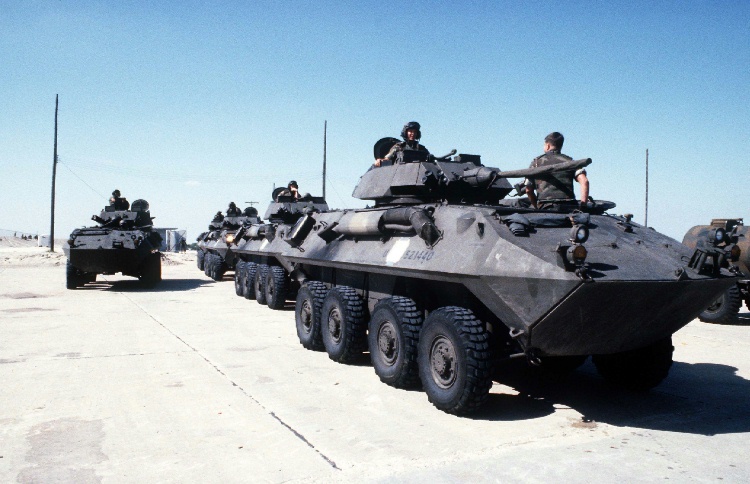 The LAV III formed the basis of the US Army’s interim armoured vehicle (IAV) program better known as the Stryker. 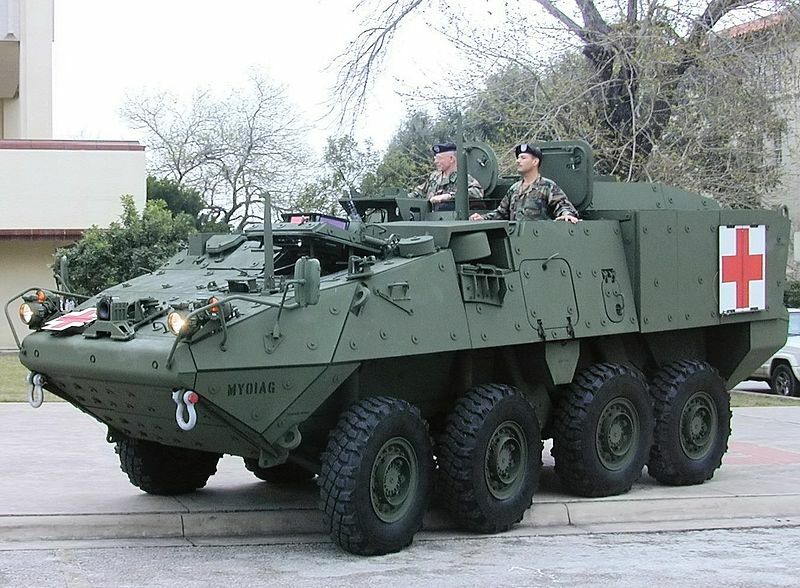 2,000 Strykers are planned for acquisition, first deliveries occurring in July 2002 for a service entry in November 2003. The first deliveries occurred in July 2002. Mowag Piranha IB 6×6 TOW (Panzerjager 90) of the Swiss Army in the 1980s. 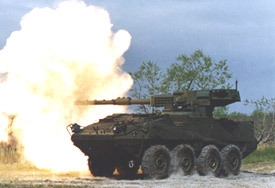 USMC LAV-25 (1983). Joint US-Canadian vehicle based on the Piranha II. Qatari Piranha II CCTS-90 tank hunter (with a Belgian Cockerill 90 mm gun). 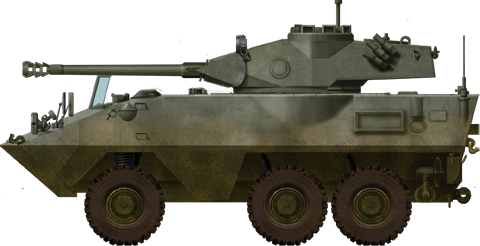 US Army/USMC IAV Stryker or M1126 Infantry Carrier Vehicle (2002). The 105 mm armed M1128 Mobile Gun System (MGS) was developed over this platform. sir can you make the Simba Fighting vehicle ? Have patience, Tanks Encyclopedia is continually expanding, and the Simba will eventually be added. 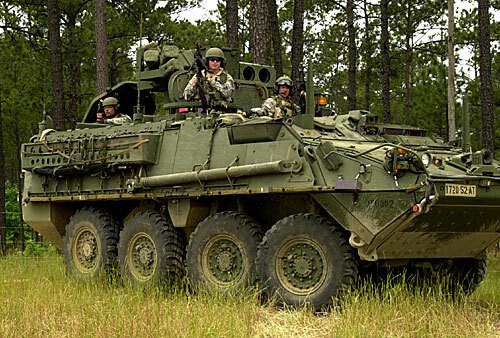 Could you possibly dedicate a page to the LAV-Stryker armored vehicles? 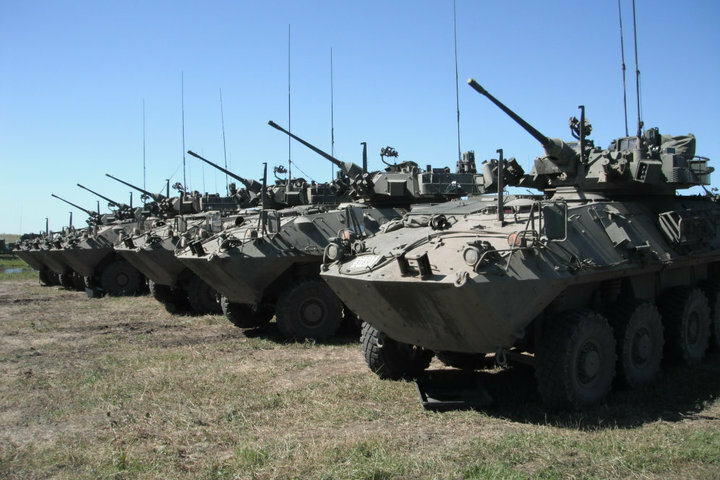 There’s a lot of info simply on the Stryker & LAV series alone along with the many variants.